in the never-ending quest to avoid blogger burnout and showcase my passion for snapping street art, wednesday will henceforth be declared wall wednesday on the mouse. This is a fabulous bit of graffiti! I wasn't having a piss, but it did make me smile! I'll be looking forward to your new Wall Wednesdays! Huh! Those are stencils, looks like. I didn't know anybody made stencils that large. Good eye! I'm off to look for triangular thingies. Love it! Wish we had more interesting graffiti here. We just hire our artists to paint a building and call it a mural! :-) Just isn't the same. Looking forward to Wednesdays here! About the only street art we have here is the occasional children's chalk drawings on the driveway! Which makes me hopeful. ha! PF made it on my blog today too! i'm going back to listen to comfortably numb again. Yay for Wall Wednesday! 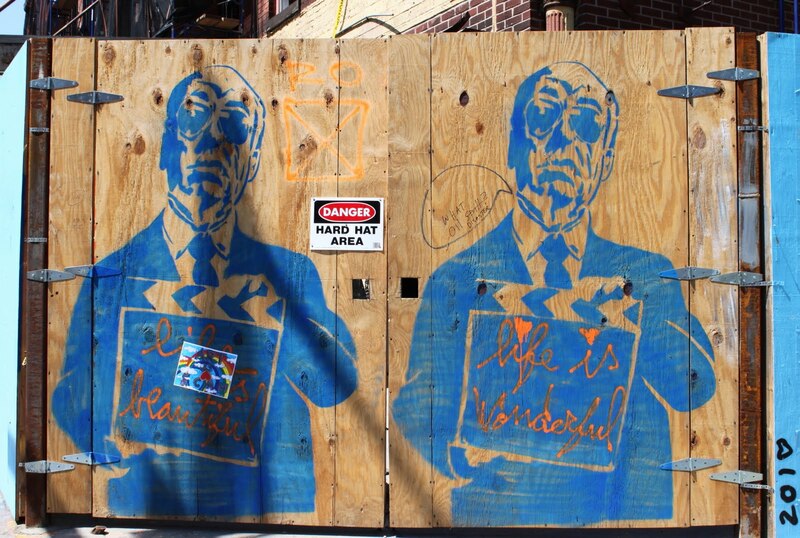 That street art is by MBW or Mr. Brainwash, by the way.